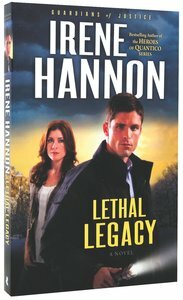 About "Lethal Legacy (#03 in Guardians Of Justice Series)"
Irene Hannon is the bestselling and award-winning author of more than fifty novels, including Buried Secrets and Thin Ice, as well as the Heroes of Quantico, Guardians of Justice, and Private Justice series. In addition to many other honors, she is a seven-time finalist for and three-time winner of the prestigious RITA Award from Romance Writers of America. She is also a member of RWA's elite Hall of Fame. Learn more at www.irenehannon. Customer Reviews For "Lethal Legacy (#03 in Guardians Of Justice Series)"
This is the final book in the Guardians of Justice series and this was my favourite! I loved Cole and Kelly, they fitted so well together as a couple. I really liked how they related to each other. Kelly, is strong but on the quieter side and I really liked that. For me, she was easy to relate to. Cole, really shone here. His is a hero worthy of Kelly! The mystery surrounding Kelly's father death goes much deeper than anyone expected and it made for a richer story. The drama and action slowly built up and then steadily ploughed on through to the end. For me the climax of the book was heart stopping and had me desperate for the resolution. My favourite in this series. Wonderful book! U.S. Marshal Jake Taylor has seen plenty of action during his years in law enforcement. But he'd rather go back to Iraq than face his next assignment: protection detail for federal judge Liz Michaels. His feelings toward the coldhearted workaholic haven't warmed in the five years since she drove her husband--and Jake's best friend--to despair...and possible suicide. As the danger mounts and Jake gets to know Liz better, he's forced to revise his opinion of her. And when it becomes clear that an unknown enemy may want her dead, the stakes are raised. Because now both her life--and his heart--are in danger. Full of suspense and romance, Fatal Judgment launches a thrilling series featuring three siblings bound by blood and a passion for justice. Bestselling author delivers romantic suspense where a US Marshall assigned to protect a federal judge finds that both her life--and his heart--are in danger. Protecting federal judge Liz Michaels is the last assignment U.S. Marshal Jake Taylor wanted. After all, how can Jake be expected to care for the coldhearted workaholic who drove his friend to despair--and possibly suicide? U.S. Marshal Jake Taylor has seen plenty of action during his years in law enforcement. But he'd rather go back to Iraq than face his next assignment: protection detail for federal judge Liz Michaels. His feelings toward the coldhearted workaholic haven't warmed in the five years since she drove her husband--and Jake's best friend--to despair . . . and possible suicide.